"I am most grateful for two things: that I was born in North Korea, and that I escaped from North Korea." Yeonmi Park has told the harrowing story of her escape from North Korea as a child many times, but never before has she revealed the most intimate and devastating details of the repressive society she was raised in and the enormous price she paid to escape. Park's family was loving and close-knit, but life in North Korea was brutal, practically medieval. Park would regularly go without food and was made to believe that, Kim Jong Il, the country's dictator, could read her mind. After her father was imprisoned and tortured by the regime for trading on the black-market, a risk he took in order to provide for his wife and two young daughters, Yeonmi and her family were branded as criminals and forced to the cruel margins of North Korean society. With thirteen-year-old Park suffering from a botched appendectomy and weighing a mere sixty pounds, she and her mother were smuggled across the border into China. I wasn't dreaming of freedom when I escaped from North Korea. I didn't even know what it meant to be free. All I knew was that if my family stayed behind, we would probably die--from starvation, from disease, from the inhuman conditions of a prison labor camp. The hunger had become unbearable; I was willing to risk my life for the promise of a bowl of rice. But there was more to our journey than our own survival. My mother and I were searching for my older sister, Eunmi, who had left for China a few days earlier and had not been heard from since. Park knew the journey would be difficult, but could not have imagined the extent of the hardship to come. Those years in China cost Park her childhood, and nearly her life. By the time she and her mother made their way to South Korea two years later, her father was dead and her sister was still missing. Before now, only her mother knew what really happened between the time they crossed the Yalu river into China and when they followed the stars through the frigid Gobi Desert to freedom. As she writes, "I convinced myself that a lot of what I had experienced never happened. I taught myself to forget the rest." In In Order to Live, Park shines a light not just into the darkest corners of life in North Korea, describing the deprivation and deception she endured and which millions of North Korean people continue to endure to this day, but also onto her own most painful and difficult memories. She tells with bravery and dignity for the first time the story of how she and her mother were betrayed and sold into sexual slavery in China and forced to suffer terrible psychological and physical hardship before they finally made their way to Seoul, South Korea--and to freedom. Still in her early twenties, Yeonmi Park has lived through experiences that few people of any age will ever know--and most people would never recover from. Park confronts her past with a startling resilience, refusing to be defeated or defined by the circumstances of her former life in North Korea and China. In spite of everything, she has never stopped being proud of where she is from, and never stopped striving for a better life. Indeed, today she is a human rights activist working determinedly to bring attention to the oppression taking place in her home country. Park's testimony is rare, edifying, and terribly important, and the story she tells in In Order to Live is heartbreaking and unimaginable, but never without hope. Her voice is riveting and dignified. This is the human spirit at its most indomitable. 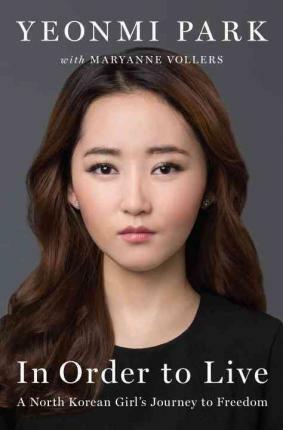 Yeonmi Park is a human rights activist who was born in North Korea.